This drop affected both the domestic and foreign markets. In Italy, the index stood at an absolute value of 141.4 basis points, i.e. 13% less than for the period of April-June 2017. For foreign markets, sales fell by 14% and the index stood at an absolute value of 99.6 basis points. This fact appears even more relevant for Italy’s domestic market where, although registering a drop with respect to 2017, the order intake index for the second quarter has shown growth compared to the corresponding value for the year’s first quarter. 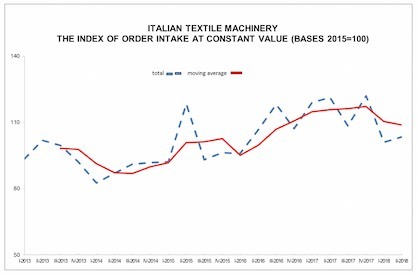 "Following an initial period of uncertainty, the confirmation of fiscal incentives for 2018 have helped re-launch investments in advanced technologies by Italian textile companies," states Zucchi.